Do you ever reflect on the value of your life? We all know on some level that our lives are valuable. We know that we are unique, and that God created us individually and with purpose, and so each of us has a unique contribution to make. A priest once said that an Adoration Chapel is the engine room of a parish. This metaphor always comes to mind when I watch the documentary film “Into great silence” about Cistercian monks in Chartreuse, France. The film, more a meditation than an informative expose of life behind the monastery walls high atop the French Alps, provides a glimpse into the engine room. There isn’t a great deal of “doing” to be seen - not if you’re looking for a command centre, bustling activity, huddles of people deep in strategic schemes – things you’d expect of an initiative whose purpose is to fuel the existence of a massive secular initiative. These Cistercians spend their day in study, individual and communal prayer, tending their gardens, chopping their wood, performing the duties of their assigned work, be it sewing new habits or repairing shoes. Very ordinary, isn’t it? And yet their dedication to that very ordinariness is a source of grace we all benefit from, through God’s providential design. St.Therese of Lisieux wanted to be a missionary, bringing as many souls to Christ as she could, but lived a quiet life of contemplation in a Carmelite convent. Through her acceptance of what God set before her, – even though it looked very different from what she dreamed of for herself – she certainly accomplished what she set out to do. St.Therese is now a Doctor of the Church, and one of our beloved of saints - known even to non Catholics. How many people have come to know, love, and serve God through Therese’s Little Way? I want to do something great for God. I want to be useful. I’m sure most if not all of us feel the same way. This urge is probably tied to our continual longing for God, because love wants to serve. Then I look at my life and what I see are days filled with unexceptional activities. Is it possible that sorting laundry and shelving books is all I have been asked to do? 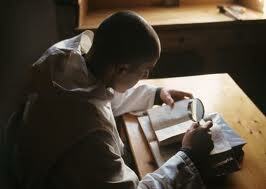 St. Therese and the Cistercian monks remind me that greatness in the Divine economy looks ordinary in earthly terms. The most important things – the most efficacious things – are usually things that look too small and simple to be powerful. If our monasteries and convents are like the Rainforest - the spiritual lungs of the world - then you and I in our homes, going about our work, are oaks and maples and willows. We may not look as grand as the mighty forest, but we’re breathing life into the world nonetheless. Wonderful, thoughtful, post! I just watched that documentary today. It moved me with the life of simplicity and silence that these men lead. Catherine Doherty, foundress of Madonna House, said, "The secret of daily living is to connect an ordinary, seemingly boring life, with all its repetitive details, with Love who is God. Then a day at the desk, when your back is aching and your mind reeling with tiredness is a day that has redeemed many souls."